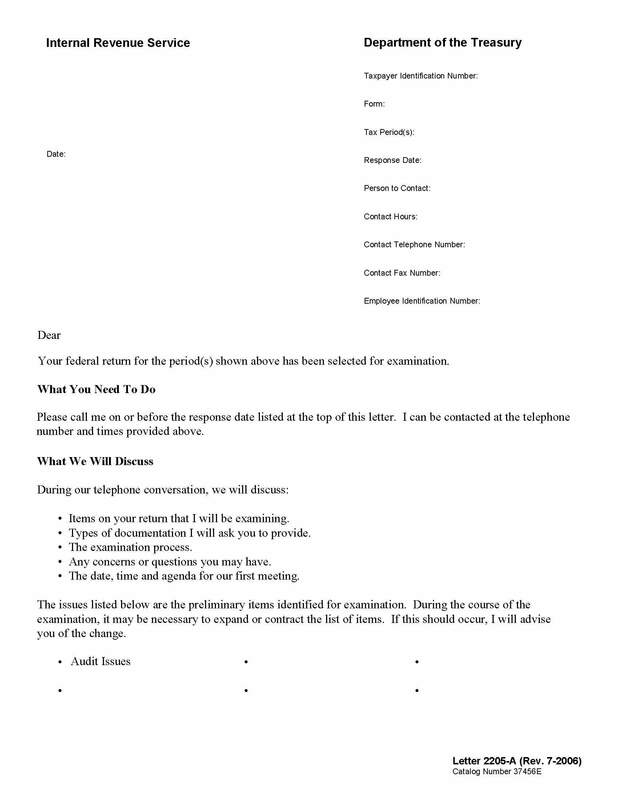 Audit Letter 2205A is used to notify you of either an office audit or a field audit. Write down the agent's name, phone number, & address for ready use. The IRS might have checked the boxes at the bottom of Letter 2205A to inform you what the issues are in your audit. But more often, the IRS will have sent a Form 4564 or Form 886A to ask you questions and request documents. Click on the links to review the Form 4564 or Form 886A and determine what to do next! If the issues are related to Schedule C or Schedule E or a business problem please follow the TaxHelp Business Edition Prep Steps. If the issues are related to Form 1040, Schedule A, Form 2106, or other personal problem, please follow the TaxHelp Individual Edition Prep Steps. The IRS will want you to answer their questions but you also have a duty to prove your case. They often want bank statements & other income papers but more often, they reject your deductions with little or no explanation. The evidence you will need is more than just a few cancelled checks or even an accounting software program or printout. Each element of your case has different evidence requirements & must be proven in the format requested by the IRS or your case will be rejected. The TaxHelpLaw Attorneys designed the TaxHelpAudit program to get you prepared so TaxHelpLaw can advocate for you! Lost Documents: An IRS audit may be unwelcome because you didn't keep your records or your records are lost or unavailable. However, unless you only used cash, you can re-create bank records & credit card records. Even if cash was used, affidavits can be obtained or we can use industry standards to arrive at a reasonable figure. See TaxHelpLaw - Lost Documents.